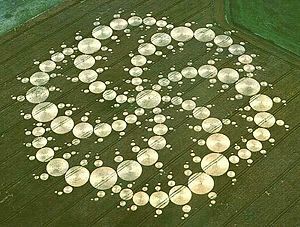 A 780 ft (240 m) crop circle in the form of a double (six-sided) triskelion composed of 409 circles. Milk Hill, England, 2001. Brooke and I are walking together. Well, I’m walking and she’s scooting. Okay, that’s not entirely accurate either. She’s actually skitching – hanging on to my arm while riding her scooter and getting pulled along. It’s a complicated arrangement, but it mostly works. She launches into a script from Max and Ruby. It’s one that’s been high in the rotation lately. They are in the library and Max is, as usual, causing trouble. It’s my job to tell him to be quiet. I shush her bunny noise on command. She makes it again. As per the script, I say, “Not in the library, Max!” She giggles. And then, for the first time ever, she takes the script one step further. I’ve never heard this before. I don’t have a practiced line to offer in return. “We type the title into the computer,” she says. Oh, I love this. I’m running with it. “How else can we look up a book?” I ask. “Is there something else you can think of that we know about a book?” I ask. I know I’m asking a lot, but it’s my job to ask a lot. To presume competence. She’s in fourth grade. They’ve been looking for books in the library at least once a week since kindergarten. “That’s a good answer, baby,” I say, “A book goes on a bookshelf. But if we want to find a book at the library, we need to know which bookshelf it’s on. Let’s think about the parts of a book. What’s on the front cover?” I ask. She knits her brow together. She’s working hard, but the answer’s not there. She’s quiet. I know she has the word. I say nothing. Eventually, it comes. And there we are. Light-years from the tight little maze of dizzying circular conversations in which we lived for so long. We cover distance now – we move and we volley and we dance and we laugh and we skip and turn and jump and hell, even skitch down miles of road. And yet, we are still in the maze. We’re just making bigger circles. I know I should be happy that we are where we are, but I’m deflated. I’m exhausted for me and I’m far, far more exhausted for her. We wrap up the conversation and I tell her that we’ll talk more about it another time. We walk in a comfortable silence for a while, until we come across a young girl riding a bike. I tell her that I like her tutu. Moreover, I like that she’s wearing it to ride a bike, I tell her, which is really sort of awesome. She smiles brightly. Still clinging tightly to my arm, Brooke leans in ever so slightly toward her. The girl looks at her, more curious than wary. I’ve learned to recognize the difference. “How old are you?” Brooke asks. “How old will you be next?” Brooke asks. Lila looks bemused and elicits a slightly awkward chuckle, but answers the question. “I’ll be nine next,” she says. Brooke is quiet. I whisper a suggestion to tell Lila her name. “I’m Brooke,” she says. Lila asks if she goes to her school. 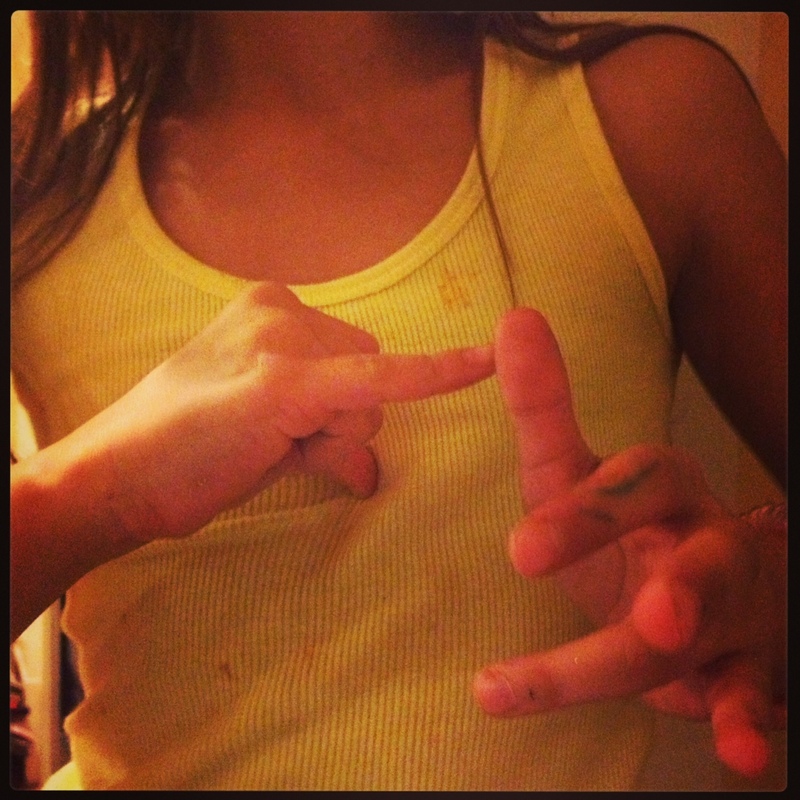 Lila points her thumb at herself and her pinky at Brooke, making the sign that they use at school to acknowledge a connection. Katie calls it the “Me too” sign. Lila says goodbye and rides off, her tutu trailing behind. Brooke and I continue our walk / sktich toward home. “I told her to have fun riding her bike,” she says. As we get closer to home, Brooke asks me if we can go out to dinner. “Just the two of us.” ((She really said that, I swear — “Just the two of us.”)) My heart soars. My smile wraps around my head. I might just as well have been invited to Windsor Castle to meet the queen. Alone. Just the two of us. I am beside myself. I explain that, as thrilled as I am that she asked, we can’t do it tonight. Daddy’s already made dinner and it will be on the table when we get back from our walk. But I promise that we will soon. She protests. I nearly crumble, but we just can’t. Not tonight. I promise. Soon. I walk the rest of the way home on Cloud Nine. So there we (really) are. In circles, yes. But they are ever-widening, ever broadening, ever more encompassing circles. As we finish our walk, I think of Lila and her Me Too sign. I ask Brooke to stop for a second. And there, smack dab in the middle of the sidewalk, I hug my girl long and tight. She does Max – “Walk!” I laugh and tacitly agree to be Ruby – “One second, Max!” I say. She makes the bunny noise. I shush her. It’s what we do. It’s how we connect. It’s our circle. Looking up books can wait. And I’ve no reason to worry; we’re bound to come around to them again soon. She really has come a long way. I love that child and can’t wait to see her tomorrow. Awesome! My son could only relate to me through Austin Powers movie lines, of course..he was a one man show. The school didn’t find it so funny by they dealt with it because at least he was talking. They soon learned that when he was anxious he fell back on it so they knew that they had to be more aware with the triggers in the classroom. He is going on 17 now and yes…the circle gets broader and better. They are awesome! This made my heart smile. Reminds me so much of circular, and then not so circular conversations with my son Jacob. That’s some girl you’ve got there! A wise professor once taught us to wait five seconds before calling on a student for an answer to a question. She explained that not everyone has the answer on the tip of their tongue. Some have to take time to process the question. Awesome post! (and they say she’s losing language?) Love her! My breath is caught in my throat… so lovely. It really does happen, doesn’t it!!! Funny, I’m on cloud nine this morning for the same reasons. My E is now in 7th grade and is taking a public speaking class for an elective. The boy who didn’t speak for years after his peers began and whose first phrase spoken aloud was Swiper’s immortal line “Oh, man!” from Dora. Public. Speaking. And his first assignment was to interview a classmate and speak about him. He showed me his list of questions and answers…lots of simple questions like “What’s your favorite band?” But also things like “If you had a robot what would you want it to do for you?” So I asked him if the teacher came up with the questions. And he said no. He came up with them. Himself. I felt like a jerk for not assuming they were his questions. But yet. This was a kid who six short (long?) years ago could not answer simple questions just like those when asked by a fifth grade buddy. Could. Not. So, yes do I get it. Go Brooke! And enjoy your dinner for two. Me too. And if my Holly could type to Brooke, she would also say “Me too”… We are a circular, scripty pair and mommy knows her parts. There was soooo much progress in that interchange, Jess. I can hear how tired you are after all you’ve been through this last month. So, as a faithful reader who remembers the interchanges on the coast of the Atlantic that left Katie cringing and you near tears (I think Brooke wanted to teach some sisters to bow), this interchange of “Have a nice time riding your bike” and B checking in that not only was that okay, but acknowledged as good work, is a tonne of social interaction progress. It’s these moments in our lives when I want to find every stranger and say, did you see that? Did you see what he said? Or did? Where I want to say, excuse my language, hell yeah! Where my husband and I give each other a look that says it all. It’s my heart soaring, my pride, my beaming. It’s those moments, man, those moments. I’ve just found your blog and I’m glad I did. My daughter is almost 5 and has so many things in common with Brooke. I cry a little everytime I read your posts mostly because I feel happy and hopeful for both our girls and every special needs child. It’s so nice to know you are not alone. Thanks! I am so glad to have stumbled across your blog! My 5 year old has just been diagnosed with HFA (it’s preliminary, we still have more testing to confirm), and I can relate to so many of your posts. It’s so great to have someone so eloquently put words to such things. I think I’ve cried a little at every post I’ve read. My son doesn’t really do scripting, but the rest of your conversation about looking for books is one that we would have. We do Awana at church, which is a lot of scripture memorization. I say “s stands for savior” and he repeats. Then I say “what does “s” stand for?” He says “i don’t know” It takes us the whole week just to be able to answer that question. It can be sad and frustrating sometimes. I’m hoping to get to the part where they start giving me strategies to help him. That’s the only reason I really wanted to pursue a diagnosis. It was such a connection to hear you call what she does a “rotation”. My daughter is 10, and does this too. That’s exactly what it is and you just gave me a name for it! My girl loves Max and Ruby too, and we do the scripts just like you and Brooke. Our daughter goes through cycles of characters that she scripts from and watches. It can be exhausting, I can so relate to what you said. But it makes her so happy : ) I too, live for those moments of clarity, where she is in the moment with me, on the same track as me. When you said that Brooke said, “just the two of us”, my heart jumped for you, I love those spontaneous moments. My husband came home from work the other day, and our daughter said, “Hi Daddy, how was work?” And my husband darted into the kitchen and we made eye contact and did a little happy dance! LOL It’s all about hope, and little victories isn’t it…. It’s good to hear you articulate what goes on in so many of our heads and hearts. BUT, I just have to say, I think Brooke was “spot on” with her answer, Jess! She may not have said “author” but that’s because she’s a visual gal, so similar to my 8-yr-old guy, and saw the author on the “binding”. I was thrilled to hear her answer! I love that our kids get there, but in their own way, right?! Well Im SOBBING. Guess i needed to read this. My Daughter will be three next month and I spend so much time worrying about how to interact with her scripting. It gives her so much joy and she does sometimes use the phrases in a context appropriate way to communicate, but weve been told by all the SLPs and ABA therapists not to encourage it as it underscores that its functional language to her when it isnt. So there is ths constant pull in my moms heart between wanting to bring my girl joy and see her eyes light up and not to have to have every moment of her life be “therapy”, and also want to help her develop language that will help her be understood by more than just her parents. So all that to say thank you for your story and Brookes story and for seeing the beauty in communication that brings joy, no matter its format.